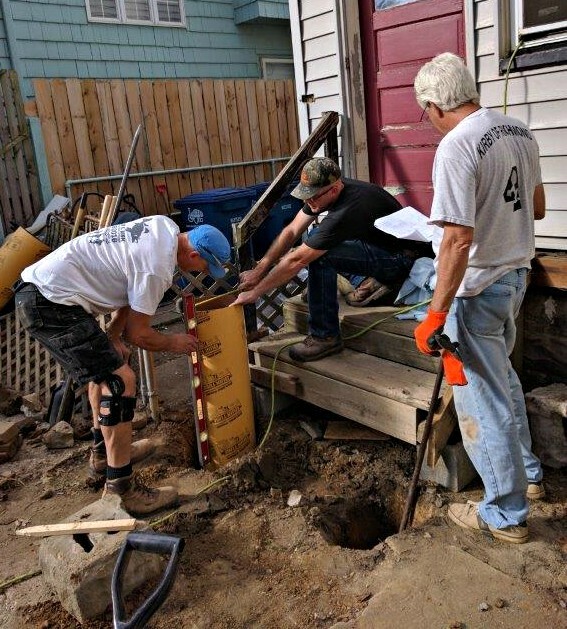 Instead, this ultra-dedicated group comprised of Lakewood residents Aaron Cooper, Carl Orban and Dana Paul devoted six Saturdays during September and October to digging a foundation and hammering slabs of lumber. 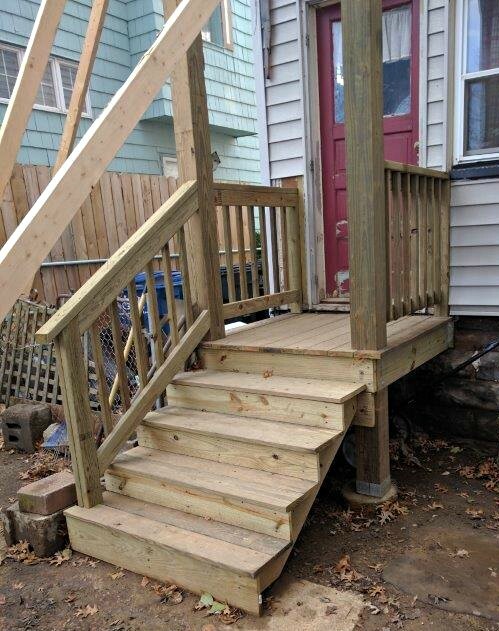 Thanks to their efforts, an elderly resident on Elmwood Avenue has seen her once-unsafe rear entranceway morph into a newly-designed porch. (Left to Right) Carl Orban, Aaron Cooper and Dana Paul prep the home for a new two-story rear porch. When this resident was referred to LakewoodAlive by the City of Lakewood’s Building Department due to the poor condition of her two-story rear porch, the nonprofit community development organization’s Housing Outreach Program sprang to action. The resident was presented with an opportunity to have her porch reconstructed through LakewoodAlive’s 80/20 Volunteer Project Supply Fund, whereby the homeowner pays 20 percent of the project cost and LakewoodAlive covers the remaining 80 percent using funding provided by First Federal Lakewood. The labor was completed free-of-charge. The A Team spent six fall Saturdays (approximately 48 total hours per each volunteer) tearing down the unsafe porch and commencing the process of constructing a new porch. This process entailed everything from crafting a porch design and obtaining a building permit from the City to digging a foundation and constructing the first level of the porch. 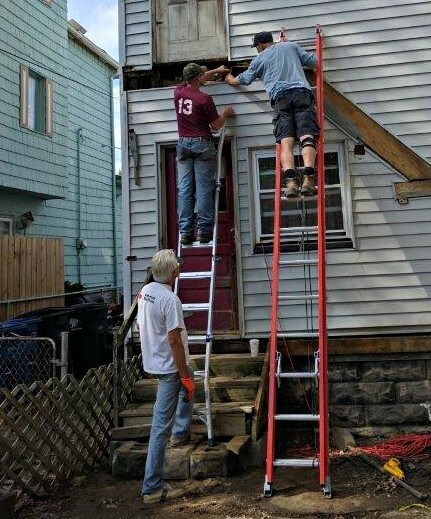 Cooper, Orban and Paul received help along the way, as LakewoodAlive board member Jim “JP” Ptacek assisted with the porch design process and volunteers from Cross Point Church in Lakewood helped lift the second-story frame into place. The A Team plans to complete the porch’s second story during spring of 2017. Lakewood’s A Team typically completes one major volunteer housing project each year, enabling this experienced team to hone their building skills while bonding together and aiding a community member. It’s projects like this that truly illustrate the power of LakewoodAlive’s volunteer-driven capabilities for aiding Lakewoodites in need.